HomeCar loan with a bad credit score. Is it possible? Having a bad credit score can put a damper on your wish of buying your dream car. Getting a car loan with a bad credit score is a daunting task as finance companies offer you less favorable terms. Car loan seekers who have a bad credit history and bad credit score must be prepared for paying higher monthly installments of the car loan. But do not get disheartened as even if you have a bad credit score you can still manage to find a lender to offer you a car loan that will not break your monthly budget. The credit score is the score determined by the Credit Information Bureau India Limited (CIBIL) from credit-related information like the type of credit availed, repayment history, credit utilization etc. This data is utilized to evaluate the credit score of an individual. The credit score is taken into consideration for determining the creditworthiness of an individual. A credit score is a useful parameter to understand the repaying capacity of an individual. A bad credit score refers to a record of past failures in making repayment of your loans. This failure can result in difficulty to get approvals for a new loan. What are various ways to improve a bad credit score? Finance companies approve car loan depending upon the credit score of an individual. An individual with a good credit score is easily offered with car loan but a person with a bad credit score faces difficulties in availing car loan. so here are a few tips that will help in improving bad credit score. Thus keeping a good track record of loan repayment helps in gaining a good credit score. Also, finance companies always prefer to disburse car loan to individuals having a good credit rating and good repayment history. Is getting car loan possible with bad credit score? Even though credit score plays an important role while applying for a car loan but the good news is that people with bad credit score can get their car loan approved from finance companies. Yes, you heard it right, getting a car loan with a bad credit score is a tedious task but it is possible. By following the below-given tips customers with bad credit score shall stand a chance to avail car loan and make their dream come true. Know your credit score: The first step to improve your bad credit score is to know what your credit score with CIBIL is. Obtain a free credit report this will help you in getting a better understanding of the bad factors that are hampering your credit score negatively. Address the factors that can be resolved immediately as it will help in repairing your credit score. Volunteer for making down payment: while availing a car loan volunteer to make a higher down payment as it will result in the lower car loan amount and low-interest rate of the car loan. Consider pre-approved loan: A Pre-approved loan is a facility offered by banks to its existing customers. These pre-approved loans are offered on the basis of the customer’s relationship and KYC of the customers. Applying for a pre-approved loan stand a higher chance of obtaining car loan even with a bad credit score. Borrow carefully: While dealing with a bad credit score it is very important to borrow car loan carefully i.e. borrowing must be done according to your repayment capacity. Maintain the ratio of payments to less than 50% of your salary. 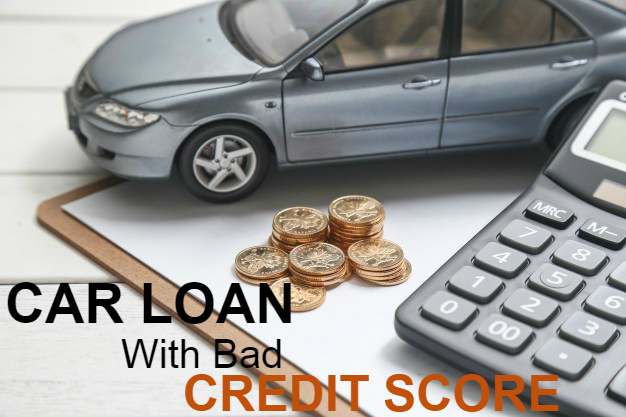 thus with a bad credit score, you cannot expect to get a car loan at a low-interest rate so it is advisable to improve your credit score so that you can avail attractive offers on your car loan.